this high-comfort eco-house requires 20 times less energy and divides by 200 the house's CO2 emissions (compared to a standard European house) ! * The words "dream house" are shamelessly taken from the film comedy "Mr Blandings builds his dream house" starring Cary Grant and Myrna Loy. The film was a box office hit upon its release in 1948. You can see on this panoramic view the ventilation pipes going upwards to the upper floor, the highly insulating windows and doors, the highly insulating red bricks (in addition to rockwool for wall insulation three times more efficient than usual). By looking closely, you wll also notice the thermal bridge suppressors (polystyrene blocks at the horizontal junction between the walls and roofs. As an environmentalist, Bruno Comby wanted for his family a house requiring as little energy as possible, yet that can be constructed for an acceptable price, and that can be duplicated anywhere in the world. This house is the result of this dream. The concept of the house chooses optimal construction methods in each area and for each equipment for heating, ventilation, air conditioning, and other equipments. The design of the house was entirely done, the equipments chosen and their size and efficiency precisely calculated by Bruno himself in such a way as to reduce the energy requirement to the maximum possible extent, without sacrificing modern comfort. By taking care of the design and also part of the construction work himself, Bruno maintained the cost of the house quite low, similar and even lower than that of a standard (unefficient) house. The heating and air conditioning of houses and buildings are one of the main sources of CO2 emissions in the world today. In France, they represent 93 millions metric tons of CO2 per year, and 42% of the energy consumption in the country. The primary energy need for heating the existing homes in France are at an average value of 240 kWh/m2/year in 2007. It is possible, as this dream-house demonstrates, to build homes that drastically reduce both the energy requirement and CO2 emissions (up to 200 times less CO2 emitted than a standard gas-heated home of the same size) simply by constructing this type of long-lasting efficient homes and buildings that do not emit (or almost don't emit) any CO2 and even that produce more energy than they consume (positive energy houses). The simple techniques that are to be used to reach this goal are described below. By combining these different, simple and proven techniques into the same house, as this dream-house shows in Houilles (a typical suburb of Paris, similar to te surroundings of any large city in the world), the energy requirement of our homes can be very much reduced, to almost nothing. This dream-house can be duplicated and constructed almost anywhere (there may be just some minor differences to adapt this dream house to each type of geographical and geological situation and type of house desired). Heating, ventilation and air conditioning (HVAC) of houses, apartments and offices is one of the main sources of CO2 emissiosn in France as elsewhere. We have the technology at hand to build dwellings and office buildings which emit almost no CO2. Bruno has put together a number of these technologies, as we shall show below. Here is a partial list of some simple and ecological HVAC building technologies which he used to build his ecological dream-house at Houilles near Paris. These reduce the energy consumption by a factor 20 or so, and reduce the CO2 emission by a factor 200, as compared to gas heating currently being installed in new contruction in France. - at the level of planning: minimize the outer surface of the construction, where heat is exchanged with the surrroundings, by making the house compact, as near as possible to a cube or sphere (this house is a cube); and orient it so that the main windows are toward the south. In winter the sun will contribute to heating the house and in summer awnings or shutters will keep the sunlight and direct heat from entering. Plan for thick walls - the thicker the wall the better it is an insulator, no matter what the material. 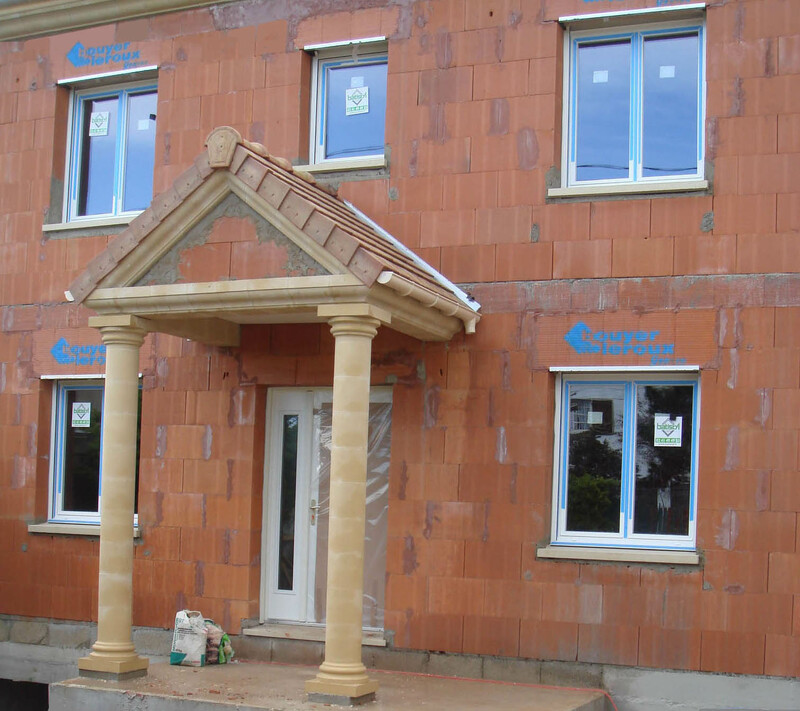 - choice of building materials: prefer long lasting insulating material such as insulating bricks, and cellular concrete like Siporex (low density concrete) or Insulating bricks that are 5 times better than classical cinder blocks for the same wall thickness, and they cost about the same. Insulating bricks moreover have greater mechanical strength and the mason can build more rapidly with them. French and European suppliers of insulating bricks include Wienenberger's Porotherm, thermopierre (formerly Siporex) sold by Xella, monomur bricks, and Bouyer-Leroux's brique Thermo BGV . Bruno has chosen to build with Thermo BGV which have the greatest thermal efficiency (BGV = Briques à Grande Vitesse "high-speed bricks" because the construction is done in much less time using these bricks than standard concrete construction). Click here to go to the bottom of the page to see a video and practical instructions for building a wall with these BGV insulating bricks. A pallet of insulating bricks has just arrived. They have a vertical alveolar structure - type BGV - highly insulating and easy to build with. Using a laser to level the first row of bricks accurate to a millimeter. Since the joints are very thin, the first layer of bricks must be perfectly level. Using a straight-edge to prepare the bed of mortar before laying the first layer of bricks - it must be perfectly level and flat. Then the mason can lay the bricks very quickly. The second layer of bricks. The wall goes up quite fast; it takes little more than a day to complete each floor. Terra cotta bricks can be cut with an alligator saw. See this video of putting up a wall of insulating bricks. showing all the clever tricks of the brick manufacturer, Bouyer-Leroux. - be sure to make air-tight joints between the masonry walls and the windows, doors, rolling shutters, and all. If this phase of the work is properly executed, you will save a lot of energy over the whole life of the building. Air-tight joints are a simple thing to do and an important element of a highly efficient home. There is no point in building a highly efficient home if the joints aren't done properly (beware of small details). Breaking the thermal connection at the floors. One simply inserts an insulating block, polystyrene in this case, at the floor level to prevent the concrete slab from touching the outside of the building thus preventing cold from penetratating into the dwelling space. There are two types of polystyrene blocks to break the thermal connection. : those who are perpendicular to the concrete beams and those who are parallel to the beams. The technique of breaking the thermal links implies negligible cost, yet it is little used even in new construction where it could be most easily applied. Click to see the KP1's isorupteurs KP1. There are many manufacturers and many models of doors. Some doors are more insulating than others and the best insulated ones are not necessarily the most expensive. We have chosen a door of steel on both surfaces with foam between the two steel plates. It is better insulating and more solid, it better resists break-in, requires no maintenance and costs the same as a door made of wood which are chosen in France by most of the new home-owners by tradition, although they are less efficient, more expensive, more fragile mechanically, will not last as long, require being repainted every few years and are thermally less-efficient. There are different systems of insulation. We have chosen St Gobain's OPTIMA quality GR 32. Its coefficient of insulation is about 30% greater than traditional glass wool, for the same thickness. This system is about twice as insulating as the 8 cm of polystyrene habitually installed in most new construction in France these days. Added to the insulating power of the insulating bricks, we have about 3 times less loss of heat through the walls. Instead of heating the atmosphere by exhausting warm air from the house, the double-flow ventilation (DFV) recovers the heat of the warm out-going air and transfers it to the intaken air (whence the term double-flow). This is accomplished by a heat exchanger consisting of a system of metallic plates. The yield approaches 95%, that is, 95% of the heat in the exhaust air is transferred to the intaken air. Installing a DFV system adds a few thousand Euros to the cost of the house but leads to significant savings of energy as well as improved comfort. Air flow can be controlled and the air is filtered and thus of better quality. For his ecological house, Bruno has selected the DFV Hélios type KWL EC 450 Pro plant providing up to 450 cubic meters per hour of pure, filtered and preheated air which enters through the puits canadien (see below). At 300 cubic meters per hour, which is quite adequate, and running 24 hours a day, the DFV will consume 50 watts, and cost about 40 euros a year (and I remind you that in France electricity is over 90% nuclear and emits very little CO2). 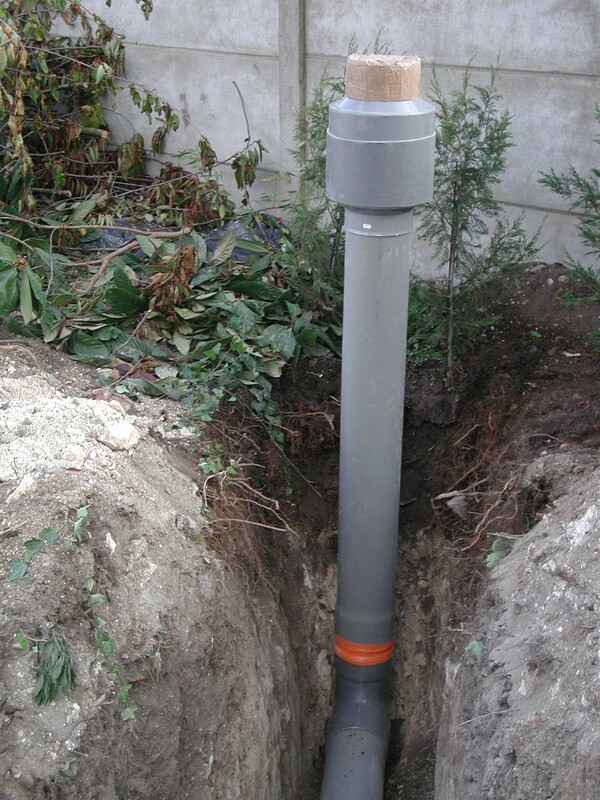 The principle of the puits canadien &endash; to preheat intake air in winter &endash; or the puits provençal &endash; to cool intake air in summer &endash; consists of passing the intake air through pipes buried about 2 meters underground before it enters the house. At that depth the temperature is very nearly constant all year 'round &endash; about 14 degrees C. So it is possible to preheat the intake air in winter, up to about 14 degrees, and correspondingly to cool the intake air in summer, providing air conditioning gratis. For an adequate flow of air, the tube ought to be 15 to 20 cm in diameter and 50 to 100 meters long. A 50 watt electric fan will provide an adequate air flow for a large house. Click here for a complete photo report on the our installation of Bruno's puits canadien in the Paris region . 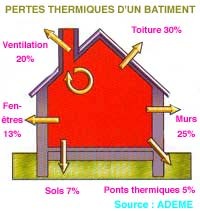 Combining these construction methods and technologies in the same house, reduces the heat requirement by a factor of 5, the energy consumed by a factor of 20 and the carbon dioxyde emissions by a factor 200 (in France), compared to a standard construction satisfying the most recent European regulations now in application (RT 2005). For Bruno's ecological house, the heat pump, the HVAC unit , the double-flow ventilation and its heat exchanger (DFV) as well as the entry of the external air through the puits canadien are grouped together in a small room situated in the basement. Such a house with all modern comforts should cost no more than 100 Euros per annum for winter heating, with air conditioning thrown in gratis. It will require practically no maintenance &endash; neither logs to put in the fireplace nor ashes to sweep out, neither burners to regulate nor the obligatory annual chimney sweeping. It will emit virtually no CO2 &endash; about 200 times less than the same house built to modern standards and gas heated. Everything inside the house has been optimized to be thermally efficient. This is an ecologist's dream house which has come true ! We would like to emphasise that all the techniques and technologies used by Bruno are available and are or can be mass-produced. This optimised ecological dream-house takes advantage of all these techniques and technologies in order to minimise its energy requirements to the greatest possible extent. This house exists &endash; in Houilles, a close suburb of Paris. To our knowledge it is the only house in the world to achieve this level of energy savings and comfort. For additional information, to learn more about the energy requirements and the performance of this ecological dwelling, to find the tools and the software to calculate and simulate the thermal and energy performance of your own house, visit our "blog de la maison écologique" (in French, see http://babelfish.yahoo.com/ for a free translation of this web page) or come visit the house under construction. To visit this ecological house, join EFN and come see the house or participate in the annual general meeting of EFN (next annual meeting in Houilles on saturday 13th december 2008). Journalists can contact EFN (Environmentalists For Nuclear Energy) at: +33 1 30 86 00 33. See our blog on this ecological construction project at http://comby.blogspot.com (see http://babelfish.altavista.com/ for a free translation of this page).